Uglyworld #644 - Falling In With The Wrong Crowd, originally uploaded by www.bazpics.com. Since the conversation I had this morning with Cinko about me heading off next Friday to work in America for the next 6 weeks he's been too hot to handle so he was sent out into the garden to cool himself down. This seemed like a good plan until Wedgehead came running into the house screaming for me to "comes quick baz, we has troubles to deals withs". 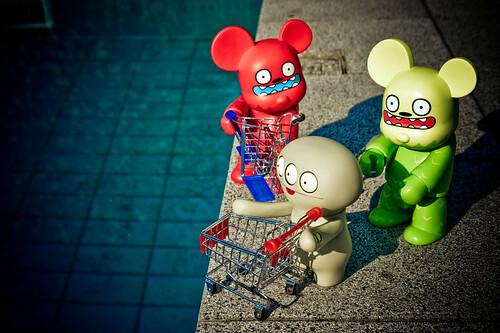 Wedgie pointed me in the direction of the swimming pool, where the problem was clear to see - two of the neighbourhood's bad kids appeared to have recruited Cinko into their shopping trolley gang. This particular gang was renowned around the neighbourhood for throwing shopping trolleys into swimming pools and peoples gardens, and at the very moment I arrived on the scene they had Cinko all lined up to throw one into our very own pool!!! "Cinko, what the hell do you think you're doing?" I shouted at him, to which he replied, "Why does you cares, you is goings away and not takings me withs you!". It was one of those moments where giving him more crap would have only made the situation worse so I had to counter with, "Cinko, if you REALLY, REALLY want to come with me, we can make it happen!". Cinko's face lit up with that awesome smile he's known for and at the same time he screamed, "Takes your trolleys and shoves them where the suns don'ts shines!" and threw the shopping trolley he had been planning to submerge in the pool only a few minutes before in the direction of the two scallywags who were already high-tailing it out of our garden.